The bouncer who stood blocking the door was a few inches taller and outweighed me by a hundred pounds. I had him sized up pretty good, gotten his superior dimensions, pushing into him as I was, but still hadn’t figured him to be a lefty, so when he swung, wordless, he caught me flush. I took it full, hadn’t moved an inch, just felt the popping thud travel through my body. The bar was a Ukrainian place on 2nd Avenue in the East Village. I had never been before, just walked by a thousand times, don’t know why we chose it that night. It was the first or second day in three months I hadn’t at least sniffed some heroin and I was bitter and sick. I was looking to get shitfaced, at least make my nausea acceptable, take the edge off what was admittedly a mild withdrawal. I’d been weaning myself off slowly for the previous couple of weeks, but I still wasn’t pleased about having to clean up: my parents were coming into the city a few days hence for my graduation and I was going through a ridiculously extensive job interview process besides. I guess maybe this, my anger, my displeasure at having to stop heroin because of my parents and a job, my ennui in this life-moment of university graduation, made me rip apart the bar’s bathroom, but whatever it was, I did it. Pulled the already creaky stall from the floor, pissed on the piss-stained wall, cracked a cracked mirror. My first mistake was not leaving directly thereafter, but sitting back down to finish my drink, and then having another. My third drink is when the proprietor discovered his annihilated men’s room and called the cops and the bouncer blocked the door. Just after, claustrophobic and flushed, when I tried to get out. The bouncer swung and hit me hard, not as hard as I’ve ever been hit (I’ve been hit several times), but damn hard all the same. I didn’t go down, just latched onto him trying to avoid more damage, even threw in a couple of kidney shots. After we danced a while he tossed me off, catching me square again: this is when I went to the floor with my hands wrapped around my head. Thank God one of the guys I came with (a former Marine – Oo-rah! ), broke the bouncer’s nose with a right cross as he lifted a bar stool up over his head to smash it down on me, his face full of snarling message. My friend’s shot giving me the space I needed to get back to my feet and engage the three more who jumped in on the bouncer’s side, lapdog bar patrons siding with the man after seeing his nose graciously exploded. I got in some decent shots but was mostly taking damage. My nose started to bleed, a cut opened over my eye, the side of my face already throbbed. Somehow, sometime, somebody got merciful and called them off. The fight trickled down and I bled. We waited for the cops. 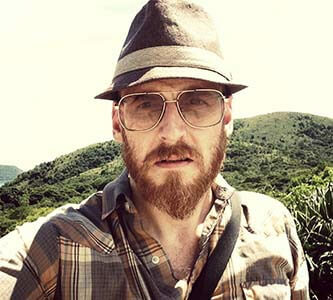 Erik Wennermark used to live in Hong Kong, but now writes prose in Tokyo, Japan. You can find his writing in Guernica Magazine, PANK, The Rumpus and lot's of other places. Follow him on Twitter. This entry was posted in Featured, Fiction, Lit and tagged bouncer, boxing, damage, Erik Wennermark, Fiction, Fight, footwork, job, kidney shot, shots, southpaw. Bookmark the permalink.